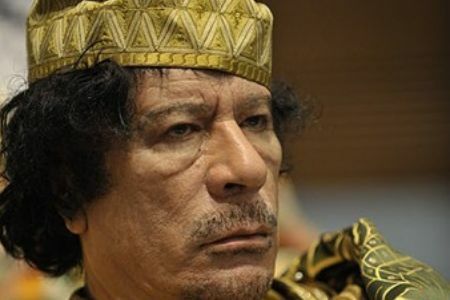 Libyan ruler Muammar Gaddafi has vowed to defeat NATO after warplanes of the Western military alliance bombarded parts of the capital Tripoli. “NATO is bound to be defeated” Gaddafi said in the speech broadcast on loudspeakers in Tripoli's Green Square as thousands of his supporters held their biggest demonstration in weeks, AFP reported on Friday. "We are determined to change nothing in our country other than by our own free will ... We are resisting, we are fighting," he noted. Gaddafi's speech came hours after several heavy explosions hit Tripoli. At least five more blasts were heard in and around the Libyan capital early Saturday. Libyan government forces shelled the eastern and western gates of the port city of Misratah on Friday, leaving 10 people dead and injuring 40 others, Ahmed Hassan, a spokesman for revolutionary forces said, adding that all the victims were civilians. The spokesman said Gaddafi forces are bombing Misratah every day. He stated that NATO did not carry out any airstrikes on Gaddafi forces on Friday. Libyan Prime Minister al-Baghdadi al-Mahmudi has said the Gaddafi regime and revolutionary forces are holding talks to find a way to end the crisis. However, opposition forces have denied this. Mahmoudi further explained that the negotiations have been held in Egypt, France, Norway and Tunisia and that they can name the opposition figures who have attended the meetings. Mikhail Margelov, a Russian envoy to Libya said on Thursday that officials from the National Transitional Council (NTC) have held meetings with the Libyan regime in European capitals including Berlin, Paris and Oslo.